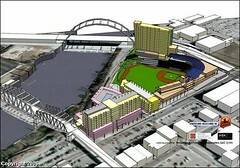 I just got back from the public unveiling of more details about the new Sounds stadium downtown. I had to leave early, but most of the good stuff was at the beginning. Turnout was pretty impressive — the room was packed with baseball fans and civic fanboys (and girls) like myself, as well as some Nashville politicos, including my rep, Mike Jameson. 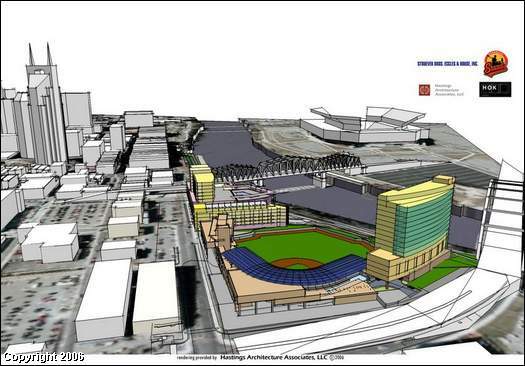 Representatives from the Sounds as well as SBER, the development firm, were on hand to present. To this end, the new stadium’s playing field itself will be recessed slightly into the ground — there will be no outfield wall, giving direct visibility of the playing field from across the river, the Shelby Street Bridge, or the greenway/public areas behind the field. These public areas will start with a greenway along the river behind the stadium and continue into a “public area”, where the greenway meets Demonbreun — which will be extended through past 1st Avenue. The space flanking both sides of the newly-extended Demonbreun will be allocated for retail space: likely hotels and cafes. One particularly interesting feature of the new park is how they plan to deal with the giant hill (the “rocky outcropping”, as he referred to it) that resides in the East side of the site. Apparently it’s entirely bedrock, and rather than try to get rid of it, they are going to just carve out an area behind the outfield there. It will be available as seating (standing?) room during games, but will be open to the public as part of the greenway/public space when there isn’t a game. I wasn’t a big fan of the idea of the new Sounds stadium, but from what I’ve seen, they are at least going about it with some semblance of concern for the community. I particularly liked the renderings that showed giant condo/retail buildings on 1st avenue where my apartment building now stands. I guess they’ve made their intentions there perfectly clear. *Sniff*. And where it the giant guitar shaped scoreboard?